Jewelry has been commonly perceived as a beautiful piece of wearable art. With its infinite possibilities of designs and artists/designers who will awe you at every glance at their spectacular work. It is no longer thought of only with precious metals and gemstones, it is now thought of with a wider eye, the eye of creativity, in hopes that we will wear it against our skin, over our clothes -sometimes beneath-, in our hair and on the accessories we carry around with us. It is an expression of art in media we may have not thought of, or perhaps, even considered before. 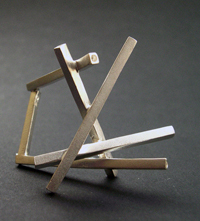 Contemporary jewelry is referred to as current, from World War II to the present, and is focused in combining contemporary design, its traditional goldsmithing techniques, with non-traditional materials like glass and organic matter, and with new and modern materials, such as polymers, nylons, acrylics. Designers now express their creativity using digital technology, allowing them to visualize their designs in a three-dimensional, virtual space, the instruments are adapted to the materials they use, like laser cutters and polishers, dipping chemicals to achieve a particular finish. It’s a different world, it’s a different philosophy, it’s contemporary jewelry design. 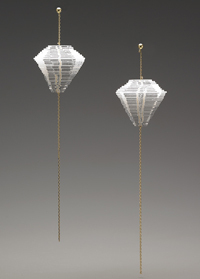 We could say that ‘contemporary’ jewelry is the jewelry we like to wear today. We want originality, we want uniqueness, we want to wear something special, that says our name, or mirrors our mood and taste. It is time to be part of the small niche, in which jewelry is mostly bought by collectors and museums, and step up to the latest in jewelry design. It is not necessarily a costly decision I must add, there is something for everyone, and there is definitely something for you and me. Be true to the materials you decide to wear, be proud of them, wear them as they are, it be leather, fiber, gold, let it be what it truly is. Wear it boldly and with confidence. Find a designer/artist that appeals to you, read about him or her, this might be a conversation piece, and what better to talk about, but of art and design!